WhiMSy love: My 1st Knitted Project! I just completed my first knitted creation! Even though it is full of mistakes (& this wee wallet actually started out as a mug cozy), I am rather proud of myself!! The cherry on the top is the vintage button. I learned to decrease stitches & even add a button hole. It definitely gave me confidence to attempt another project. Maybe I'll give that mug cozy another try. That is just soo cute! 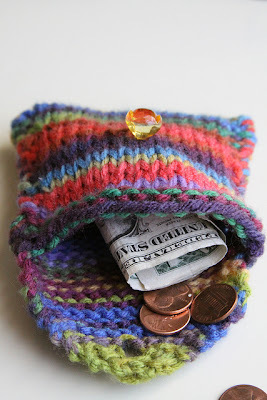 I think that wallet is way cuter than a mug cozy. You ROCK! Good for you! And great job! Don't all girls need a little didy like this? Who doesn't need a mini wallet for incidentals?! This very colorful and pretty, I love it! That button is great. 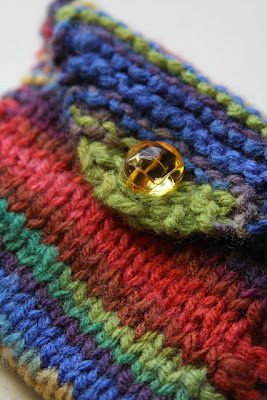 Just curious, was the yarn colored that way or did you swith the colors to get this multi-hue effect? Congrats! I crochet, but have never tried to knit. You did an awesome job! Ooo, that looks very nice! I hope you keep at it! I knit, and I like it a lot. If you didn't know, there is a great website for knitters. Ravelry.com. I myself am on there. If you want to look me up, that's cool. =] My name on there is MonicaFB. =] I promise it is a good site. It's packed full of patterns and tips and tricks.